Congratulations to Dr. Kelsey Stoerzinger, Pauling Fellow at Pacific Northwest National Laboratory (PNNL), on being selected as one of the 2018 Caltech Young Investigator Lecturers in Engineering and Applied Physics. The award offers a talented Ph.D. student or postdoctoral fellow from underrepresented groups a way to connect with potential collaborators and colleagues at Caltech. 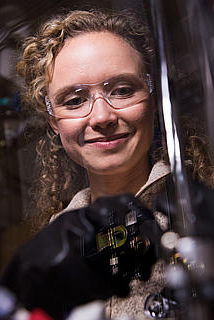 The committee selected Stoerzinger for her research into catalysts that, one day, could lead to clean scalable storage of solar energy or other intermittent power sources. Mentored by PNNL's Dr. Scott Chambers, Stoerzinger is uncovering the secrets of reaction mechanisms and the activation of molecules needed to store and produce electricity by understanding catalysts' electronic structures and surfaces. As part of her research, she uses x-ray photoelectron spectroscopy and molecular beam epitaxy at the Environmental Molecular Sciences Laboratory, a U.S. Department of Energy Office of Science user facility. This research is just part of her broader efforts to answer fundamental questions that are limiting alternative energy sources. Her mechanistic understanding of catalysts can guide the rational design of better materials that facilitate reactions to "store" solar energy in chemical bonds. A prolific author, Dr. Stoerzinger has co-authored over 35 articles in her career to date. She's a member of several professional societies, including the American Chemical Society and the Materials Research Society. At PNNL, Stoerzinger is a member of the Chemical Transformations Initiative. She will travel to Pasadena in April 2018 to speak to students and faculty at Caltech.